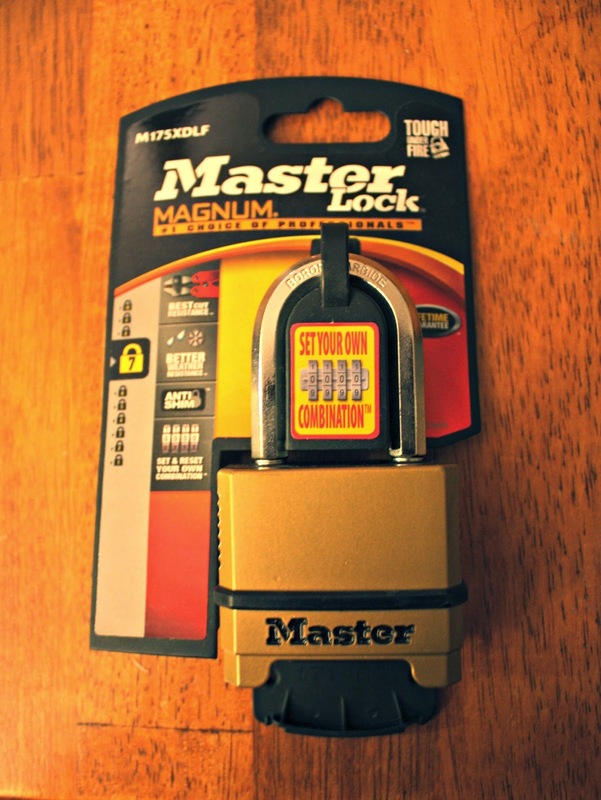 **Disclosure: Thank you to Master Lock for providing us with a Combination Padlock to try out! No compensation was received. All opinions are 100% our own. Prepare ahead: Put together an emergency kit including water and nonperishable food items. Don't forget to prepare to feed your pets as well. You can label items with dates so you can easily rotate them out if they are past expiration. Secure outdoor belongings: You can secure your belongings in an outdoor shed or garage. 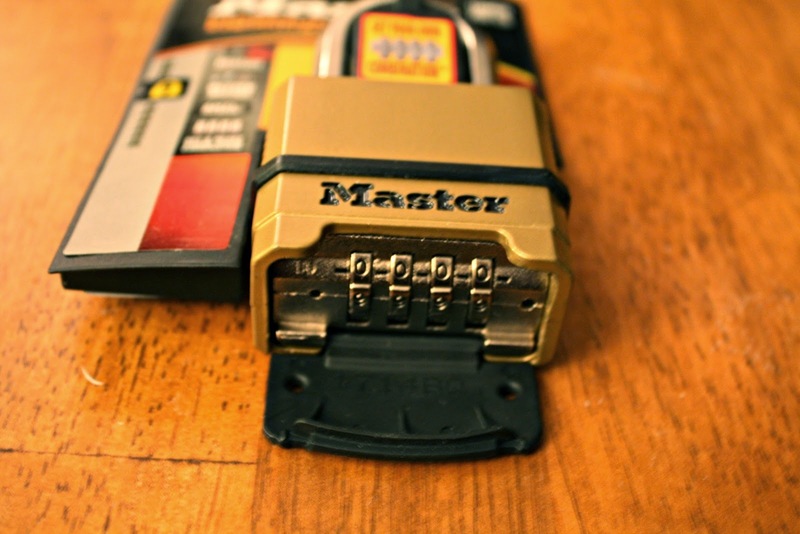 Keep doors locked with weather-resistant locks. For items that cannot be moved inside, an adjustable locking cable may be used. You can use the cable to lock items like table and chairs together. Go cordless: Be prepared with an adequate stock of batteries for flashlights, radios and more. Consider external battery packs for charging cell phones. As you can see, the lock is fairly heavy duty! I don't think a storm is going to break this lock free! Before using the lock, we set the combo. To do this, you need to remove the instructions from the plastic casing. You will need to cut them out--which can be a tad tricky. Then, you follow the simple instructions and voila! Setting the lock was very simple. But, be sure to keep the instructions safe you can easily reset if necessary and write down the combo to store in safe place. 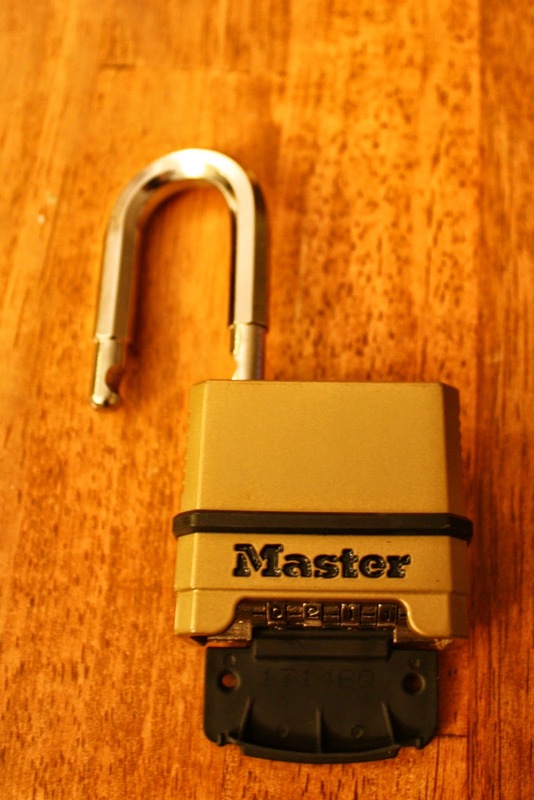 Easy to use, this heavy-duty lock is perfect to secure gates, shed doors and more! I try to move everything indoors if it is going to be a really bad storm. It depends on how bad the weather is going to be. In the event of a hurricane, we put everything possible inside (house, shed etc), Those things we can not bring inside, we tie down. Satire them in garage , shed ,or attic. I keep things in the attic, shed or garage if bad weather comes my way. I try to get everything in our shed. It never fits. Put in the barn and tie down outside swings. I move them into the garage! I put as much as I can in the shed and also start unplugging all unnecessary items. I put them in the shed or garage. We put everything in our shed, under our porch or in our basement. Or if it is too big we move it out of the wind and close to a protected place. I keep our items safe by storing all of the paperwork that is important along with other very important things in ziploc bags inside of tupperware. I bring items inside or put them in the garage. I keep most things inside, the rest are in a shed outside. The bad weather in my area isn't too bad. We usually try to tarp things, though we used to have a shed. We put things in our shed and even in the trunk of our car.